- The 3 - layer non - stick coating gives you the right balance between abrasion resistance and release properties for a pleasant cooking experience. - Convenient ergonomically designed handles with a special gripper surface. Beginning 1980: Mr.Avinasiappan, a young B.Sc. graduate with 9 years experience in family owned stainless steel Business had a strong desire to become an industrialist. But with a small capital and established giants in stainless steel business, what could be done On analyzing the Chennai market Mr.Avinasiappan, found that there was a need for quality and affordable buckets, drums, milk cans and chettinad container. Mr.Avinasiappan thus began his humble beginning along with his brother Mr. Karunanidhi. 1985: Having enough experience in stainless steel business Mr.Avinasiappan pioneered the cutlery manufacturing under the brand name MURUGAN in Chennai. With a bouquet of kitchenware of remarkable quality, impeccable design, enduring longevity and most of all the right pricing the cutlery was a runaway success. Thus MURUGAN brand was born. 1988: Milk boilers, Idly cookers and water filters were introduced in this year and gained the favor of the public with ease. But, what is so unique about these They are all Joint less products made of single sheet stainless steel. 1991: MURUGAN becomes a Brand leader in cutlery in the entire South India(Tamilnadu,Andra Pradesh, Kerala and Karnataka) and became a common household name. 1999: Mr.Avinasiappans son Mr.Sudarsan, after having a sound technical foundation in NTTF, completing his Diploma in Tool and Die-making and after having worked in MNCs for around 2 years, joined his father and uncle in their business. 2002: MURUGAN entered the Pressure cooker market with a unique feature "Speed is our strength", which is another feather in the cap. 2004: For the first time in India, MURUGAN has introduced a new concept in Pressure cookers. Pressure cookers as such without cooking utensils, does not fulfill the cooking needs of a housewife. So, MURUGAN has introduced a combination of essential cooking utensils along with Pressure cooker to create a cooking solution. The caption goes Cooking solutions not just cookers thus fulfilling the cooking needs of a housewife. 2005: Started manufacturing Hard Anodized cookware and pressure cookers with the brand name ANHARD. These cookware are scratch-free, black in color, cooks faster, fuel efficient, Non-staining and looks new for years. 2007: The traditional handi was introduced in a novel design by the name of MODPOT in the cooker form. The unique shape enables the steam to evenly spread in the inner wall of the cooker resulting in thorough cooking to give healthy and tasty food. 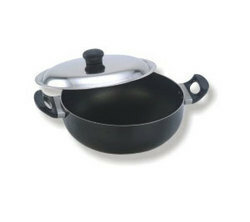 Introduced Non-stick cookware with 3 layer greblon coating which is metal spoon friendly. 2008: Introduced the 1st ever induction range of cookware like Pressure cooker and tava.